The name Nettleton has been synonymous with Jewellery in Ontario since the Late 1800’s when J.E. Nettleton opened the first store in Penetaguishene, Ontario. Striking out on his own in 1916, at only twenty five years old, J.E.’s son George G. Nettleton, moved to Ottawa. 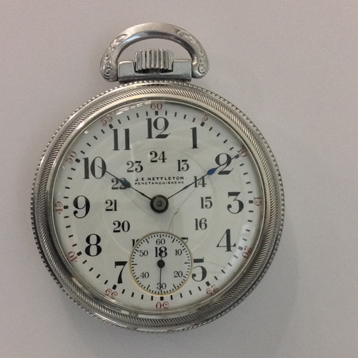 With a local business partner William M. Haskett, they opened Nettleton & Haskett Watchmakers at 196 Queen St. and within the year had outgrown that location and moved to 93 Bank St., a stone’s throw from Parliament Hill. It was a tumultuous time to start a business in Ottawa with World War 1 now in its third year. 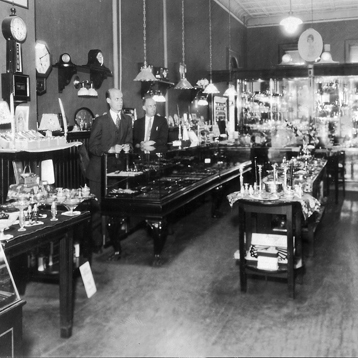 One of the unique aspects of the store at this time was the reputation Nettleton had earned as watch inspectors for drivers, engineers and conductors of the major railway companies of the time, Canadian National, Canadian Pacific, the Grand Trunk Railway as well as New York Central Railways. This was a business relationship that would continue into the 1980’s. Undaunted, despite the challenges of the times, George’s prospects improved and in 1923, now the sole owner, moved to 108 Bank Street. In 1924 George’s younger brother Harold Nettleton moved from Penetaguishene to Ottawa to work for George. Despite the harsh years of the great depression and World War II, Nettleton’s Jewellery continued its success as a quality family-owned and operated business focused on personalized service. 1947 saw the passing of George Nettleton at the age of 56 and George’s son Douglas joining the family business to work with Harold. With new energy and a post war air of prosperity in Ottawa, Nettleton’s continued to build on their strong reputation and loyal clientele. In 1952 the 108 Bank Street store expanded to include 106 Bank Street, doubling the retail size of the store. In 1956 Douglas Nettleton took over ownership and management of the store when Harold followed his own dream to be the proprietor of a jewellery store. 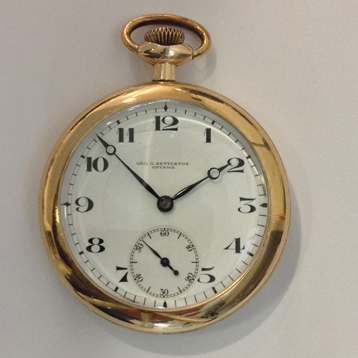 Douglas continued the tradition of watch inspections for the railways as well as expanding the store’s reputation for diamond rings, gold and silver jewellery, watch repair as well as custom jewellery. Between 1973 and 1978 Douglas’s three sons, Richard, Cameron and Geoffrey became part of the store’s history as the fourth generation to work in the family business. 1n 1986, with new energy and passion for the business , the brothers relocated the store to the Met Life Building at 225 Albert Street and two years later opened a second store in the Westgate Shopping Centre. 1995 would see changes with the retirement of Douglas Nettleton. This year also saw major challenges for the brothers with major renovations to the MetLife building resulting in a move of the downtown location to the Royal Bank Centre, 90 Sparks St. Nettleton’s stayed on Sparks St. for 13 years till 2008. After 92 years in downtown Ottawa, Nettleton’s had to vacate in order to make way for federal government offices. In high spirits and confidence in their abilities the brothers carried on the family business from the Westgate store. The Westgate store celebrates 27 years in business in 2015. Richard, Cameron and Geoffrey have worked together for over 40 years, continuing their family’s traditions of quality diamonds and customer service in the Canadian Jewellery business. The 3 brothers are looking forward to celebrating Nettleton’s 100th Anniversary in 2016.